Members of the Occupy Wall Street movement marched through Manhattan yesterday to the mansions of Rupert Murdoch, David Koch and other billionaires to protest the profits their corporations are turning during such dire times. “I don't appreciate the bashing of all the hard working people who live and work here and pay the taxes that support our city,” Mayor Bloomberg told reporters at a press conference in the city’s Bronx library. "The city depends on Wall Street. Let's not forget, those taxes pay our teachers, pay our police officers, pay our firefighters. Those taxes we get from the profits companies and the incomes, they go to pay for this library,” said the mayor. The 99-percenters rallying against the Manhattanites billionaire buddies of Bloomberg say that those he has defended are actually only adding to the problem of corrupt corporations destroying America. Around 1,000 members of the Occupy Wall Street movement marched through New York yesterday afternoon to the homes of the five top businessmen in NYC, including News Corp CEO Rupert Murdoch and JP Morgan Chase’s Jamie Dimon. They say that the tax breaks handed over to these wealthy elite are allowing them to only get richer while both wages and jobs continue to be cut. “99 percent of the residents of New York are going to suffer from this tax giveaway so the one per cent who already live in absolute luxury can put more money in their pockets,” one protester told ABC News. Also targeted in yesterday’s march were wealthy residents Howard Milstein and John Paulson, both financial magnates that live in New York. 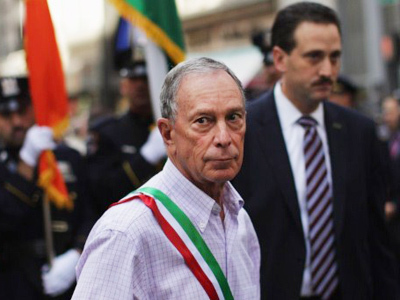 While Mayor Bloomberg may be tolerating the demonstrations, his recent statement would lend many to believe that he does not support the cause. President Barack Obama, however, has acknowledged that the participating protesters are rallying for a just cause. Though Plouffe may offer the president’s support, Obama has been called into question for the choosing of some corporate big-wigs to help with his jobs plan. RT reported yesterday that several of the names on the President’s Council on Jobs and Competitiveness include CEOs of billion-dollar corporations that have increased profits since the recession, all the while trimming away thousands of jobs.